It was a hot summer day running the hill during one of our Krav Maga Outdoor Bootcamps. Along with working on defensive tactics, the training consists of four rounds of physical conditioning: Two short trail runs, a half mile circuit training course where you walk, jog or crawl to each station to do push ups, squats, mountain climbers and crunches followed by a (quick?) sprint down and back up an 1/8 mile steep grassy hill, we finish out our day by breaking up into teams where all of the exercises are done with one or more of our team mates. We were just finishing up the second round of PT (Physical Training) on the hill and there were a couple of the guys that fell behind the pack a bit. When we the main group was done, rather than just sitting down to rest while the others finished, one of the guys got up and jogged over to complete the course with the two people who were still finishing. It only took one person to step up to inspire over half of the group to join in to finish the course with them. Leading from the front. Sharing adversity. Leaving no one behind. After we all finished I explained that if we didn't take care of ourselves; were too exhausted or recklessly hurt ourselves during the course, we wouldn't have anything left to help others even if we wanted to. You have to have something left in order to give. If you are exhausted, depleted and running on an empty tank so to speak you won't have anything left to give to others. This is a big reason to take care of yourself, not out of selfishness, but out of selflessness. You have to have something to give something. "It" could be many things: Time, patience, love, understanding, strength, attention, money, knowledge, influence, etc. If one of your friend asks to borrow money from you, however you are struggling to pay your own bills, you aren't in a good position to help. If you are attempting to teach someone something, yet you don't know what you are doing, what happens? You have to first learn before you can teach. If you are at your wits end, you may be irritable, not because of what others do, but because you allowed yourself to become so depleted that anything can set you off. Maybe you have difficulty prioritizing your time, so when you son or daughter wants to spend some with you, you put it off for another day. Maybe that day never comes? If you have to have abundance it's easier to share. The same holds true in the opposite way. If you are so joyful that happiness overflows from you spilling on everyone around you, you have something to give. 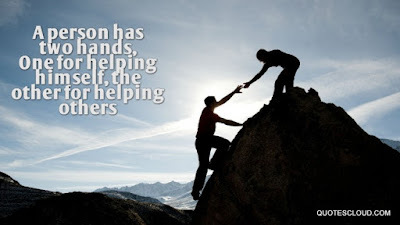 If you are taking care of yourself (selflessly not selfishly) so you have something to give, you are in a much better position to help out when someone need it. I explain this in my story of the Olympic Swimmer and the Lifeguard. Before you jump into the water to save someone make sure you can swim! What are you doing to take care of yourself so you can be more selfless than selfish? Remember that you have to have something to give!